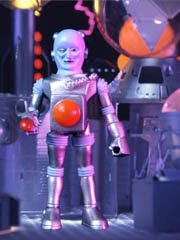 "Remember the silver & gold plating on Galactic Holiday OSM 1 & 2 figures! Well wait until you see the lavender & turquoise! #wowzers!" 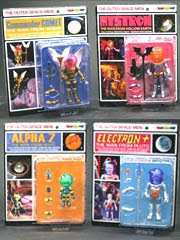 Of note are numerous updates on the new figures shipping in a few weeks, specifically Alpha 7, Electron+, Commander Comet, and Mystron. The photography is really sharp and the fully-painted final figures should be shipping in December. 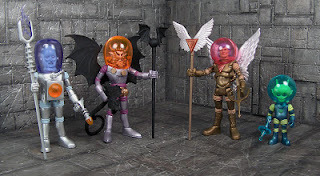 If you can't wait for these figures to show up-- and you know I can't-- you'll want to see the article Galactic Clarity at Onell Design. In it you'll find 7 new photos of the final product, which, if you're a fence-sitter, should convert you. The painted figures always look gorgeous, and these are no exception. 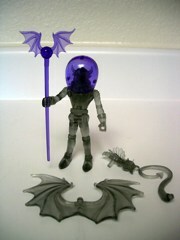 At 11:11 PM EST (or so we're assuming) the newest Outer Space Men should be going on sale. Get those browsers ready! Or... go do something else, come back, and THEN get your browsers ready! While you wait, Onell Design posted a preview of the product photography and it's really cool! Do check it out and read up on it. UPDATE: They're up! They're also $50 a set before shipping-- last year's collection was $40. They're due to ship in early December. That pretty much says it all! 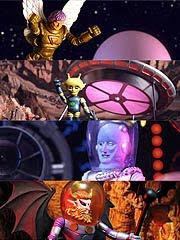 Fully-painted Mystron, Commander Comet, Alpha 7, and Electron+ are on deck but what does "pre-order" really mean? Last year, the 2010 Infinity Edition shipped roughly December 18... so that would be my rough delivery guess, but they'll confirm it for sure soon!